Grey-headed Flying Foxes - or Fruit Bats - are one of Melbourne's most common animals. But you won't see them until they fly out from their homes at night. If you go to bat HQ to watch them fly out, you'll never see anything in Melbourne wilder or more exhilarating. Tens of thousands of bats make their way to all points of the Melbourne compass, to spend the night feeding on pollen, nectar and fruit. As they set off, you'll feel like you're watching a vast flock of air-borne dinosaurs. 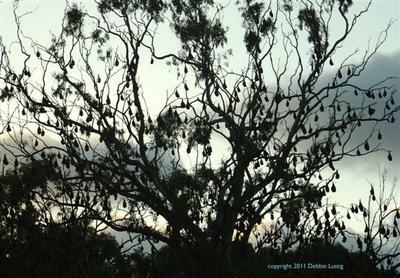 At sunset, the bats begin to leave Yarra Bend Park, Kew. First one, then ten, then hundreds and hundreds of bats stream out of the trees into the sky. With a colony of between 10,000 and 50,000, this takes up to an hour. Which is where you might like to come in. Researchers conduct bat counts every month, in order to determine the health of the colony. Counts are run by ARCUE - the Australian Research Centre for Urban Ecology and take place once a month on a Wednesday at sunset. Meeting place is the car park for the Yarra Bend Park Golf Course (Melways map 2D G7). The count goes ahead unless the weather is cold, wet and windy. Call Rod on 0412 562 429 to get on the email list with all dates. 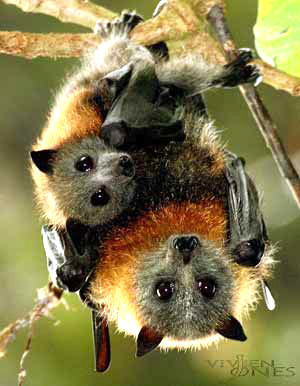 The flying fox is an important means of pollinating our forests and woodlands. It does this by transferring pollen on its fur from tree to tree, and by eating and, ahem, pooing out, seeds. Despite its ecological importance, it is declining in numbers due to habitat loss and is classed as Vulnerable. Bats are mammals that suckle their young and congregate in large groups called 'camps'. 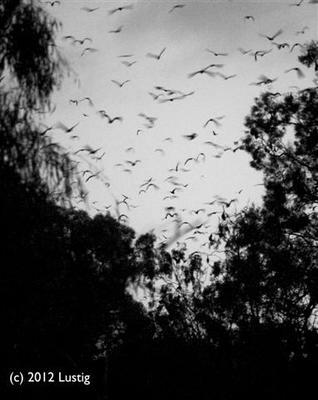 In 2003, the Royal Botanic Gardens removed its colony of bats and relocated them to Yarra Bend Park. During the day, at Bellbird Picnic Area, you can view the animals hanging upside down in their roosts. With their grey bodies, reddish-brown collars and leathery, black wings, they make an extraordinary sight. Each bat can grow up to 1 kg, with a 1 metre wingspan. Where do they go at night after Yarra Bend?